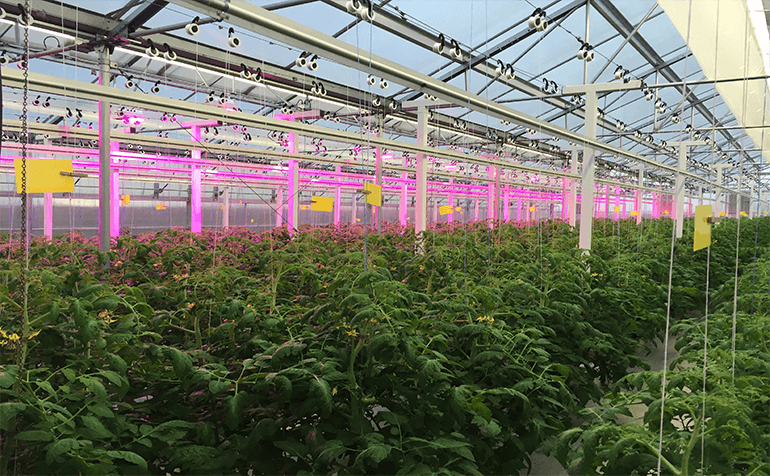 We tested winter tomato production in a central North Carolina commercial greenhouse (34.5 ̊ latitude) to compare between non-lit and LED-lit bays. 2,100 plants were grown hydroponically in a 7,400 sq ft greenhouse divided into three bays: a non-lit bay; a center guard bay; and a LED-lit bay. Plants were illuminated with 42 lights for a density of 1 light/ 59 sq ft for 15 hours/day. Seeds were planted mid-October 2014. After 8 weeks of propagation under sole-source LED lighting, seedings were transplanted to the greenhouse. Bias was given to the non- lit and guard bays by placing the “strongest seedlings” in these bays 4 days before placing the lesser seedlings in the LED-lit bay. However, by 3 weeks under LED-light, the initially-lesser seedlings were more vigorous than the non-lit plants as indicated by more compact growth and greater stem diameter. The first harvest of the LED-lit bay was 9 days earlier than the non-lit control. At final harvest, the LED-bay had a yield increase of 30%. Final evaluation indicated the LED-lit vines were taller and heavier with greater stem diameter. This study confirmed that lighting in a geographic region where greenhouse lighting was not traditionally used improved time to harvest and yield.